Everyone knows and loves bloomin’ onions, but have you ever heard of a bloomin’ apple? Fun to eat and delicious, bloomin’ apples are one of those desserts that everyone oohs and ahhs before devouring. 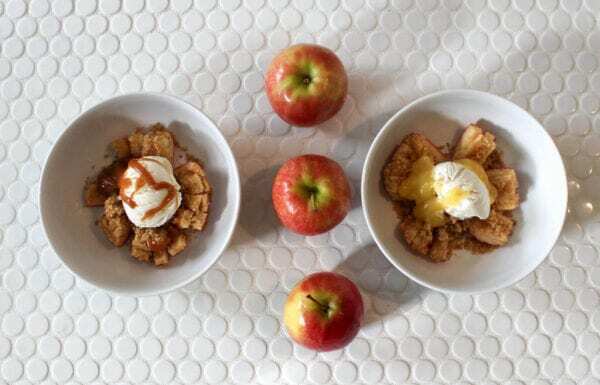 We teamed up with our brand partner, Sage Fruit, to bring you an easy recipe for Pink Lady® Bloomin’ apples and three sweet dipping sauces. While you can make bloomin’ apples with many different apple varieties, we think Pink Lady® apples are a smart choice. Pink Lady® apples are a great baking apple. They are the perfect mix of sweet and tart and their crunchy texture helps them withstand the baking process without becoming mushy. The results are soft but distinct petals that you can pick up and dip into your choice of sauce. Right now in the grocery store, look for medium to small sized Pink Lady® apples for the best value. The trickiest part of this recipe is coring and cutting the apples so they bloom. To do this, first cut the tops of each apple and use an apple corer to core. Then, use a paring knife to cut one to two rings around the inside of the apple. Next, make vertical cuts around the outside of the apple about ¼” apart. These vertical cuts should slice through all the way to the first inside ring. Stop your vertical cuts about ¼” from the bottom so the apple stays intact. Last, make vertical cuts around the interior ring of the apple, again stopping about ¼” from the bottom. After you finish your cuts, place each apple into a lightly oiled baking dish. Then place 2-3 walnut halves into the core area of the apple. Not only will this be a tasty surprise, but it prevents the crumb topping from spilling out into the baking dish while in the oven. Finally, top your apples with an oatmeal crumb topping and bake. Serve your Pink Lady® Bloomin’ Apples with ice cream and your choice of dipping sauce. Our three favorite dipping sauces are caramel, peanut butter, and sweet orange. See the recipe below for instructions on how to make each. Cut the top off of each apple and core. Use a paring knife to cut one to two rings around the inside of the apple. Make vertical cuts around the outside of the apple about ¼” apart, slicing through to the first inside ring. Stop your vertical cuts about ¼” from the bottom so the apple stays intact. Make vertical cuts around the interior ring of the apple, again stopping about ¼” from the bottom. Repeat for each apple. Place apples in a lightly greased baking dish. Place 2-3 walnuts inside the core of each apple. Make the crumb topping by mixing flour, brown sugar, baking powder, cinnammon, salt, oats, and butter together. Mix until crumbled texture appears. Top each apple with a generous amount of crumb topping. Bake apples for 35-40 minutes, or until apples begin to "bloom" and are tender. While the apples are baking, make your dipping sauces. Combine all ingredients in a small saucepan. Heat on low. Stir frequently until thoroughly combined and smooth. Add cornstarch to cold orange juice and stir until dissolved. Add salt and sugar and stir until combined. Heat in a saucepan on medium-low heat. Stir frequently until sauce thickens. Mix brown sugar, half and half, butter, and salt in a small saucepan over medium-low heat. Whisk gently and cook for 5-7 minutes. Add vanilla and cook additional minute. Remove from heat and let cool. *If you want a sweeter peanut butter dipping sauce, you can add sugar or powdered sugar to taste. Pink Lady® Bloomin’ Apples are a fun alternative to more traditional apple desserts like apple pie or apple crisp. We love those too, but sometimes it’s nice to bake outside the box! Bloomin’ Apples are also nice because they use less sugar than many other apple desserts. Let us know if you make this recipe and what your favorite thing is about it.